Students at Prince Edward County Middle School who had been struggling readers improved their SOL reading scores in spring 2015 thanks to a reading intervention plan designed and implemented by sixth-grade teacher Carol Pippen. Pippen, who will complete an M.Ed. 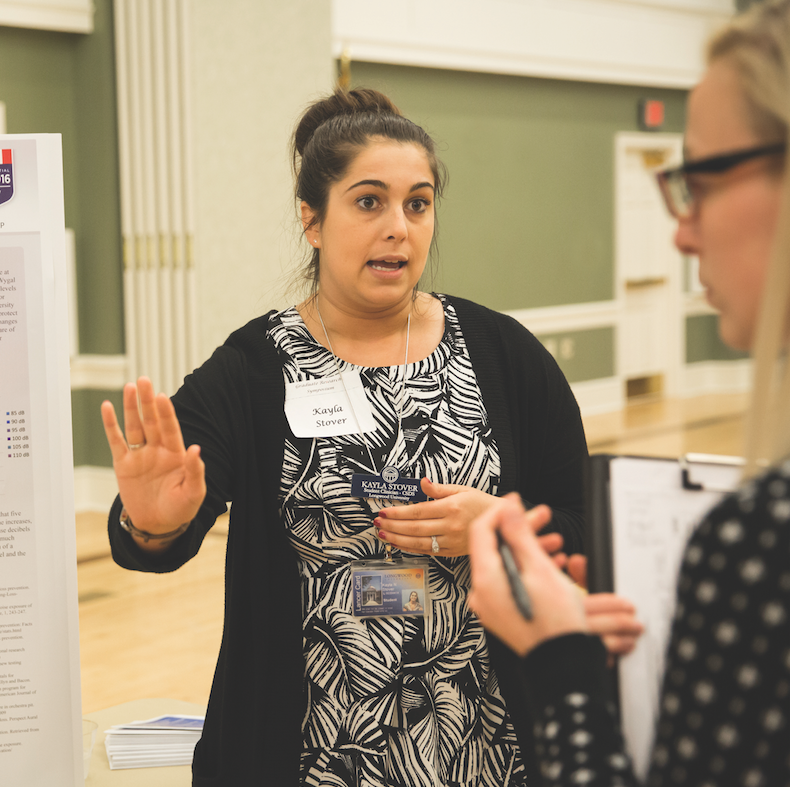 in Longwood’s reading, literacy and learning program in August, showcased that project in a presentation, “Instructional Design: Thinking outside the box,” at the second annual Graduate Research Symposium on April 22. Regardless of the topic—many of this year’s presentations were on sports-related hearing loss or helping children learn to read— the research experience has a profound effect on many of the graduate students. “One student told me that her research was life-changing. It changes the way these students look at things,” said Dr. Jeannine Perry, dean of the College of Graduate and Professional Studies. Designed to model a professional conference, the symposium, “Inquiry Across Disciplines,” was established by the Graduate Council at the initiation of Dr. Larissa “Kat” Tracy, associate professor of English, who chaired that elected group of graduate faculty from 2014-16. Participants—12 the first year, 20 this year—can read a paper or deliver a presentation, participate in a poster session or both. “This gives conference experience to students who are going into education,” said Dr. Karla Collins, the 2015-16 chair of the Graduate Council Research Symposium Committee. This year’s symposium provided something else—cash awards for the best research. Recipients were Pippen, Leanne Brady ’14, M.Ed.’18, and Nicole Walter ’12, M.Ed. ’16, in the reading, literacy and learning program; and Kelley Chaney, Killian Murphy and Meredith Peck, each of whom will graduate in 2017 with an M.S. in the communication sciences and disorders program.